SOLD! Anastasia Gorgeous Apricot Female CKC Maltipoo With The Cutest Docked Tail! Anastasia is not only a rel looker but she has to be one of the sweetest girl you will ever meet! She would just love to be your best friend for life. Imagine all the fun you’ll have with this cutie. You can take her for nice walks in the park or just cuddle with her on those lazy, rainy afternoons and she will cuddle up with you for a movie at night. Anastasia promises to always be by your side as your most faithful, four-legged companion and ready with puppy kisses to complete your day. Wouldn’t you love to make her yours today? Don’t miss out! My new name is Emma my new home is Orange Park, FL . Anastasia is one of three females in this litter of five.This litter theme starts with A as mom is Anastasia. As you can see I am my mamma favorite as I am named after her. 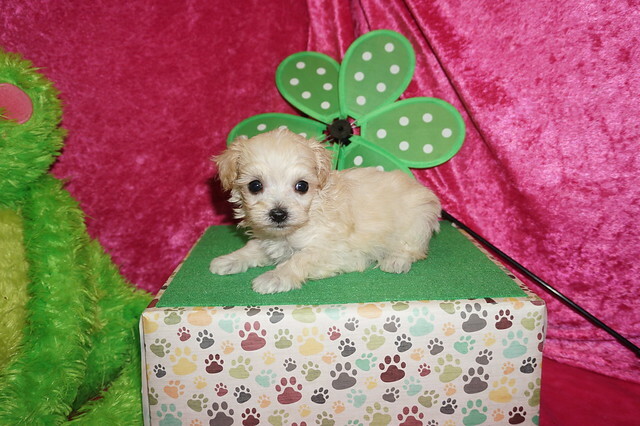 She is a beautiful Apricot female Maltipoo with the cutest docked tail . Her hair is so soft it will entice you to run your fingers through it. She is just perfect in every way and has the sweetest personality ever. Her adult weight is estimated to be 6-8 lbs Don’t take to long to decide she won’t last long! « SOLD! Angelo Gorgeous Apricot Male CKC Maltipoo With His Tail!